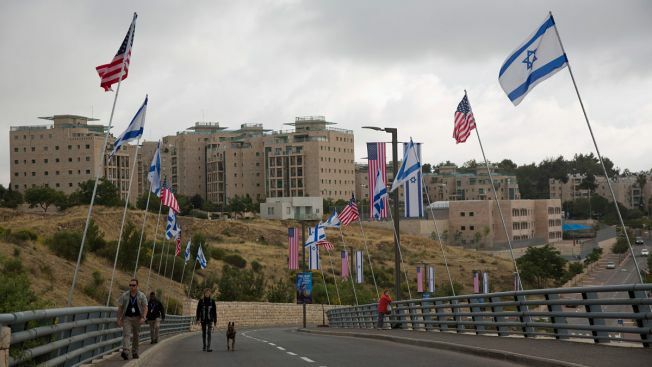 Security officers walk on a road leading to the US Embassy compound ahead the official opening in Jerusalem, Sunday, May 13, 2018. The opening of the U.S. Embassy in contested Jerusalem, cheered by Israelis as a historic validation, is seen by Palestinians as an in-your-face affirmation of pro-Israel bias by President Donald Trump and a new blow to frail statehood dreams. "This decision was driven by our global efforts to increase the efficiency and effectiveness of our diplomatic engagements and operations," State Department spokesman Robert Palladino said in a statement. "It does not signal a change of U.S. policy on Jerusalem, the West Bank, or the Gaza Strip." When first announced by U.S. Secretary Mike Pompeo in October, the move infuriated Palestinians, fueling their suspicions that the U.S. was recognizing Israeli control over east Jerusalem and the West Bank, territories that Palestinians seek for a future state.